In August the World Health Organization (WHO) declared the Ebola outbreak in West Africa as an international public health emergency. Although media attention to the outbreak has decreased, the number of people who have died from Ebola (6,856 to date) continues to grow. Unlike most natural disasters where there is an initial death toll which then drops exponentially as conditions return to normal, the death toll of a disease outbreak has the risk to grow exponentially – unless we do something about it. Personnel / Human Resources – to help manage the people who are fighting Ebola, (who are Time Magazine’s 2014 People of the Year ) keeping track of who is available, where they are and what skills they have. Logistics Management – to track what supplies are needed, where they are available and request them for where they are needed. Hospital + Health Facility Management – to manage locations including their status, capacities and requirements. Who’s Doing What Where – to support coordination and collaboration between different organizations responding to the Ebola outbreak. We’ve monitored the situation and reached out to existing partners to identify organizations wanting to deploy Sahana. We’re participating in a number of the forums organized by members of the Digital Humanitarian Network and Stand By Task Force to keep up to speed with the requirements of the international volunteer technology community. During an emergency response we have to find the responsible balance between ensuring that organizations on the ground know how Sahana can help them and ensuring that we do not distract or interfere with their response operations. Although the greatest need for information management tools is during an emergency response, this is also when there is the least time for organizations to implement these solutions. Fran’s been working hard to import baseline location and demographic data as well as the latest data on the outbreak. This has given us the opportunity to test the new HXL protocol for data integration. After hearing that tracing people that Ebola patients had been in contact with was a challenge, we were able to quickly develop a contact tracing and monitoring module in Sahana. This demonstrates the power of Sahana’s rapid application development (RAD) framework and our volunteer community! 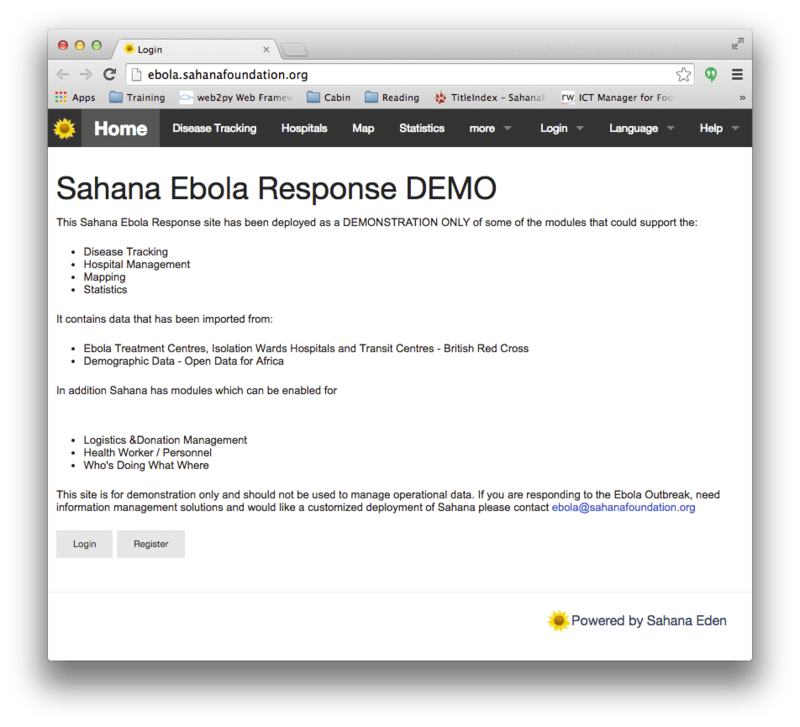 We’re connecting with numerous groups interested in using Sahana to support their Ebola response work and are currently working with groups in Sierra Leone and Liberia to identify how Sahana could be deployed there. Through careful planning and implementation these solutions can support the response to this growing crisis and sustainably improve the health care systems in these countries. We look forward to sharing more about these projects as they develop in the new year.